Let's Bust-a-Rut! Finding joy, peace and meaning in the every day. Elliot is my teacher and my test, my reward for coming home and my biggest worry. He’s the fiercely affectionate pit bull who has demanded love I wasn’t sure I was ready to give. I repeatedly declared that I was never getting another dog after unexpectedly losing my beloved pit bull, Foxy Brown, two and half months ago. But the universe had other plans: a fellow dog lover at work understood my loss and offered to connect me with Elliot’s wonderful rescue mom. It’s been about a month and a half since the 55-pound pound, tiger-striped and slightly wild guy officially became a member of the family. But there was never any doubt he had a permanent home. Elliot won me over during our first “meet and greet” when he dashed up to my office and excitedly seized one of Foxy’s toys. And if his joy wasn’t convincing enough, he put his paws on my shoulders and kissed my face until I had to peel him off to breathe. I think he literally chapped my lips and face as our introductory meeting turned into a sleepover. While he was rescued in a city and loving recuperated on a farm, he’s new to roaming about a home environment and living in a neighborhood where there’s often activity outside. In his first week, he appointed himself chief security officer of our home, planting his paws on the closest windowsill to bark at every passerby even though when strangers actually approach him he has a tendency to hide behind me. Elliot wasted no time in declaring war on every pillow and blanket in the house. He mistook the toilet for an oversized drinking bowl. And he had a hard time differentiating between the many dog toys scattered all over the house and our shoes. We knew Elliot had quite the learning curve so we bought him a fancy new crate complete with an ultra durable bed so he could be safe when my boyfriend and I weren’t home. But it turned out that Elliot is also a talented escape artist who was smart enough to not rip apart the house after freeing himself during his first Saturday afternoon alone. We figured if he could manage those three hours without damage, we could take a shot in trusting him to do the same during the week. And for the most part he has except for chewing up two paper plates and helping himself to a banana one evening while we were at a wedding. Elliot’s quirks bring new joy to our home. We quickly discovered he’s a peeping pit. He slinks into the bathroom during shower time and pops his head up in between the fabric curtain and plastic shower liner. 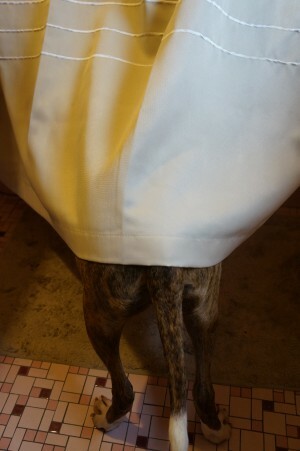 Sometimes he even pushes the curtains aside and stands on the edge of the bathtub, stretching his snout into the shower. It’s adorable, especially since he never jumps in. He also loves to snuggle – on the couch, in our bed and even while I’m sitting at my computer. Elliot has no qualms about standing on his hind legs while draping the rest of his body across my lap when I’m typing. If my office chair was bigger, I know he’d just climb on me. But of all the things Elliot has brought to our life, the most important is the lesson he’s taught me. It all comes down to love. Faced with a strange new situation, he approaches each day with an outpouring of love from bestowing good morning kisses to resting his head or paw on me when he goes to sleep in the evening. He always makes sure we know how much he loves us and we can’t help but follow his example. I couldn’t be more grateful for this incredible pooch who has shown me how much love I have to give even after losing Foxy. 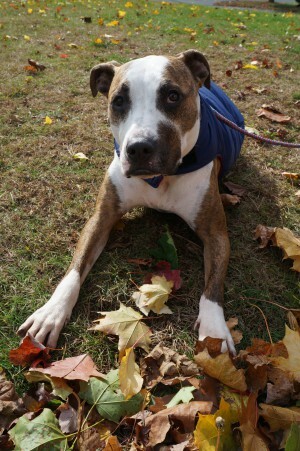 This entry was posted in Reflections and tagged dog, healing, loss, love, rescue pit bull. Bookmark the permalink. Elliott is a total Stunner!